After being discontinued in July 2018, the 2020 Kawasaki Versys 1000 is set for a strong comeback amidst tough competition. India Kawasaki Motors (IKM), after opening the order books for the 2020 Versys 1000 in November 2018, has gone on to reveal the ex-showroom price of the range-topping tourer. The 2020 Versys 1000 has been priced at ₹ 10.69 lakh (Ex-showroom, Delhi). At this price, the Versys 1000 easily becomes the most affordable litre-class adventure tourer, currently on sale in the country. While IKM had earlier revealed that the Versys 1000 will be exclusively available in India in just one colour option - the andy Steel Furnace Orange, it has reversed the decision and instead announced that the bike will be available here in a Pearl Flat Stardust White/Metallic Flat Spark Black colour combination (as shown in the image). 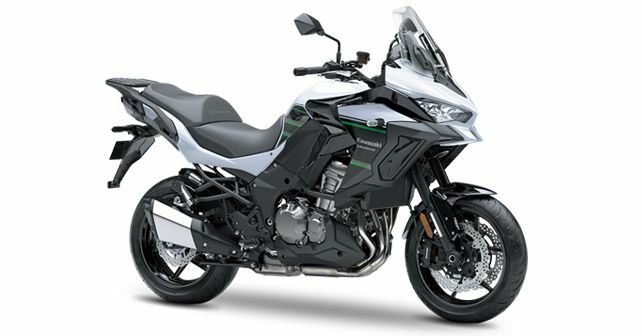 The 2020 Versys 1000 borrows its liquid-cooled, inline four-cylinder motor from the Ninja 1000 which has been tinkered with in order to provide more grunt in the lower-mid rpm range. Other mechanical and riding features onboard the new Versys 1000 include re-adjusted front and rear suspension for more riding comfort, twin-LED headlamps, an adjustable windscreen, a DC charging socket and a new digital-analogue instrument cluster. To make the Versys 1000 a strong competitor in the segment, Kawasaki has given it a fair bit of riding tech which includes electronic throttle valves in the motor, which have paved the way for electronic cruise control. Other riding features include Kawasaki Cornering Management Functions (KCMF), a three-mode Kawasaki Traction Control (KTRC) and Kawasaki Intelligent anti-lock Brake System (KIBS) over the standard ABS, which give the Versys 1000 all-around capability. Those who had booked their Versys 1000 in the pre-booking period can expect the deliveries to begin from March 2019. New customers will have to contact their nearest Kawasaki dealer for a clear estimate of the deliveries from the next lot. In terms of competition, the Versys 1000 goes toe-to-toe with the Ducati Multistrada 950, Triumph Tiger XCx 800 and the BMW F 850 GS.